Evangelist Sharon Stone is a God-gifted woman given to the Church for the purpose of winning the lost and equipping and motivating the Church in the ministry of evangelism. She has a heart for hurting women, and shows a depth of Christ-like compassion while pursuing her mission of announcing the good news of Jesus Christ. She is serving under the auspices of her husband Pastor Michael R. Stone, at the Power of God Ministries in Flint, Michigan. Evangelist Stone is a licenses Evangelist Missionary who has walked with God for over 22 years. She is the Supervisor over the youth Sunday School Department and Mother over the POGM Women's Ministry. She worked 30 years at General Motors and 23 years as a beautician which opened up opportunities for her to exhibit a unique creativity and keen insight as to how to minister and win people to Christ. 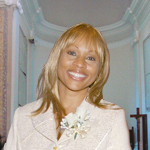 Evangelist Stone has faithfully been married to one husband Michael R. Stone for over 22 years. Together in this blessed union they have reared 3 sons, Lamarcus (wife Charlotte), Shawn, Galen, and 2 grandchildren Bryce and Caleb. Evangelist Stone has helped those without Christ confront their need for the Savior and embrace the One who can deliver them from themselves. She is truly a reaper of the harvest.